With a frustrating and unsuccessful turkey season in the books, I decided it was time to get back to the fishing. The weather in Vermont had been about as predictable as the fishing. Last Sunday, we hit the water passing snow plows and wearing our Clam Blue Suits. This week we saw record setting temps getting up into the 90’s in some areas of Vermont. I decided to go and spend a few hours on a crappie pond to check and see where they were at with the spawn. The body of water isn’t very big and I was able to cover most of it in a short time. Last weekend we were experiencing water temps in the upper 50’s to lower 60’s but it was also snowing, on this particular morning, I arrived to a water temp of 71 at 6 am! What a difference a few days can make. Being able to start fishing right at the launch I grabbed my bobber rod rigged with a Live Baby Shad by Lake Fork Trophy Lures and started to make some casts. My focus for the morning would be the shallows hoping to catch a few fish still in spawning pattern, targeting weed edges and wood. 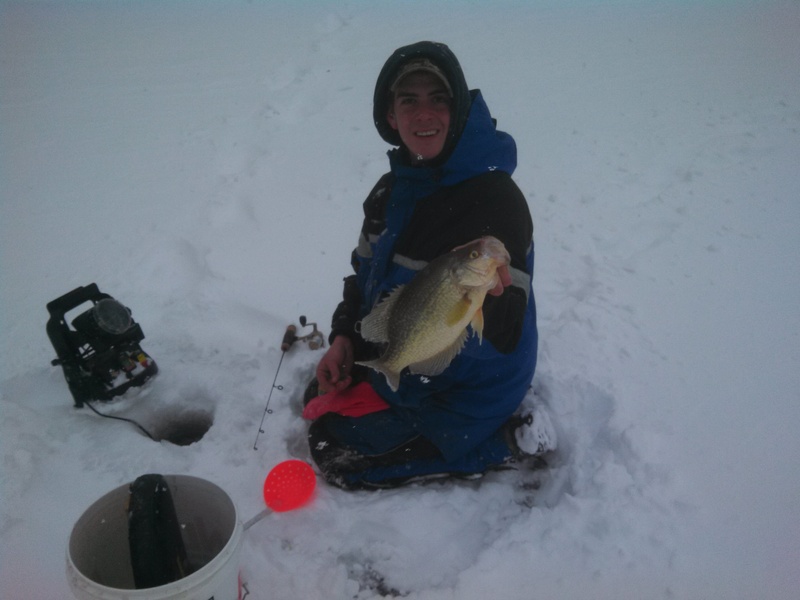 My first spot and also the most productive in the past was a bust, one small perch was all that I was able to get. I went to work searching. I was able to connect on one decent crappie along side a tree, but nothing after that. I made a big move and headed for the far side of the pond. The shoreline on this part of the lake was similar in design but the drop off was a little steeper. I was able to locate a few fish but they were spread out for sure, no concentration. I would guess that the fish are at the tail end of their spawn with many having already done their business and had slid back into a little deeper water. All in all it was a good day on the water, any day on the water is a good day! 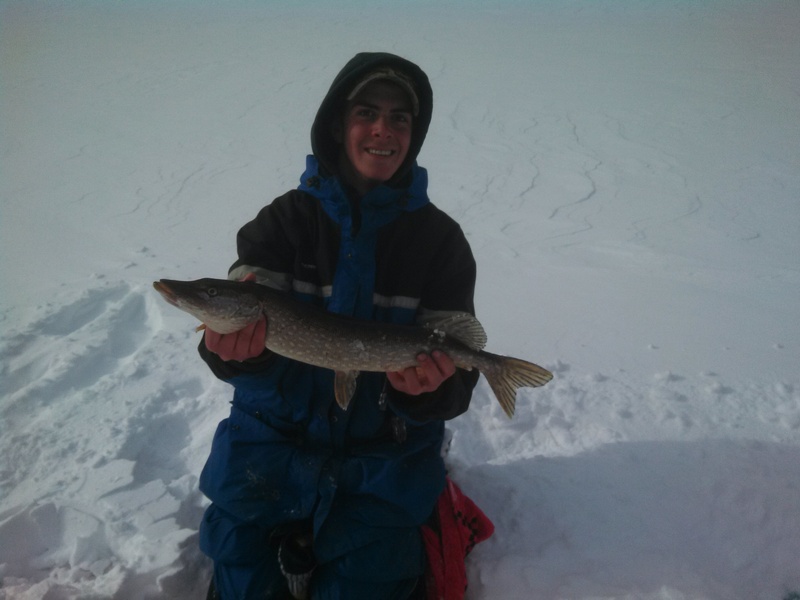 With most of the ice finally leaving our lakes and ponds, spring fishing is upon us. 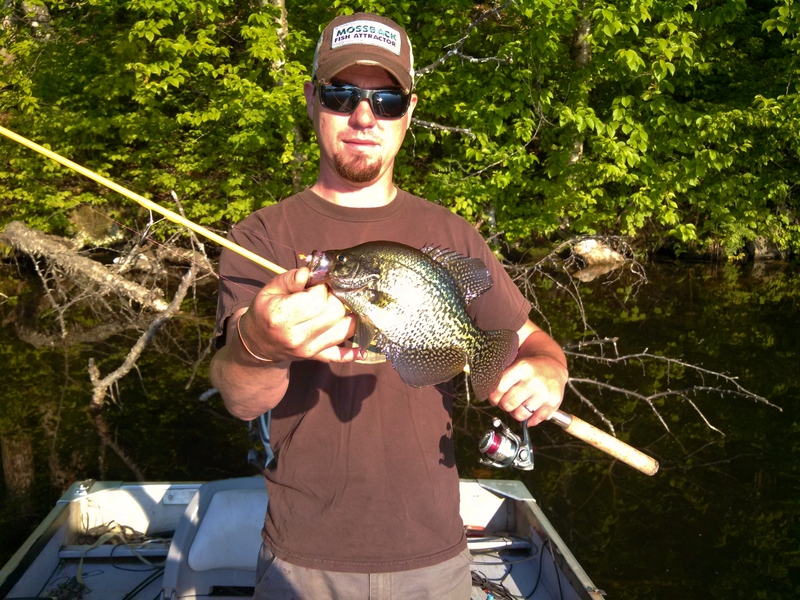 In years past, we have focused most of our attention on panfish with the occasional bass trip. The first Saturday in May brings on the opener of Walleye season but what many may not be aware of is that walleye season never closes on the Connecticut River which leaves us with great opportunities to cash in on some great spring walleye fishing. As water temperatures slowly rise, the walleye begin their yearly migration to their spawning grounds. For the river fish, that is usually upstream towards dams, or any other man made “road block”. It has become a goal of mine to target these fish while waiting for the water to warm up to get after the panfish. After a small amount of research on google earth, I decided to try a spot that looked like it might hold some fish during this time. I only had a few hours after work and grab my rod with some jigs and a couple tubs of crawlers. The spot I was fishing is passable but offers great habitat as well as fast moving water. Walleye often times during the spring will congregate in these areas and will lay just on the edge of the fast moving current. Knowing this, my cast was position just along that edge. It didn’t take long to hook into what felt like a decent sized fish. Another great thing about fishing the Connecticut River is that you never know what you are going to catch. This particular fish happened to be the target species. Without a net, I was luckily able to land it along the rock shore to get a handle on it. 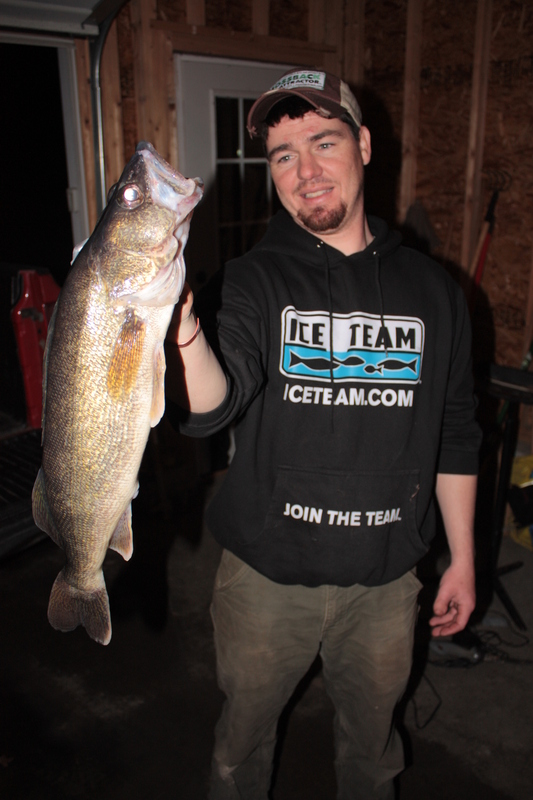 It turned out to be a nice 24″ walleye. I globed another crawler on and made the same cast which produced another hook up. A bigger walleye rolled on the surface and managed to throw the hook as it slid into the current. After a few more misses on what I think were walleye I managed to land two northern pike and a smallmouth. 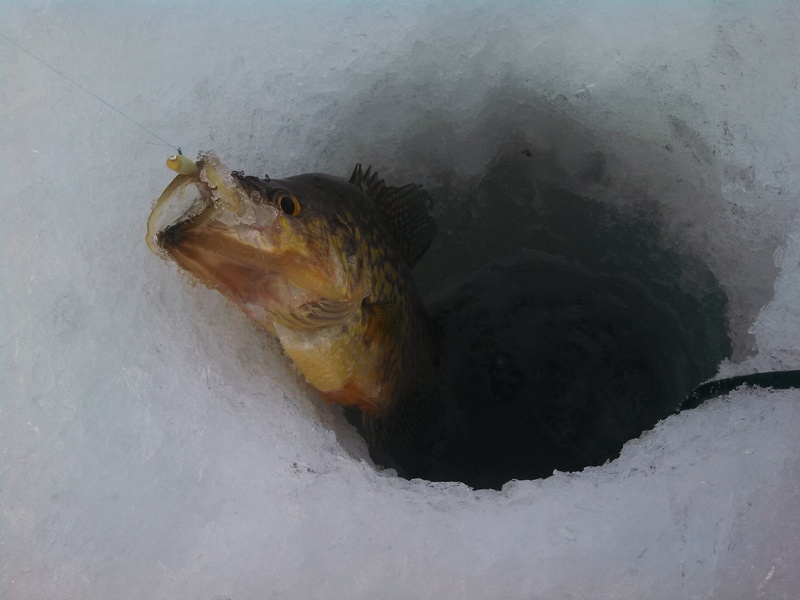 There will be more trips to the river for spring walleyes. With a few hours to kill before my wife came home from work, I decided to take a ride in search of a few crappie for dinner. I arrived to the pond a little before 4 pm and punched 6 holes in the area that usually holds a few decent crappies, perch, and pumpkinseed. 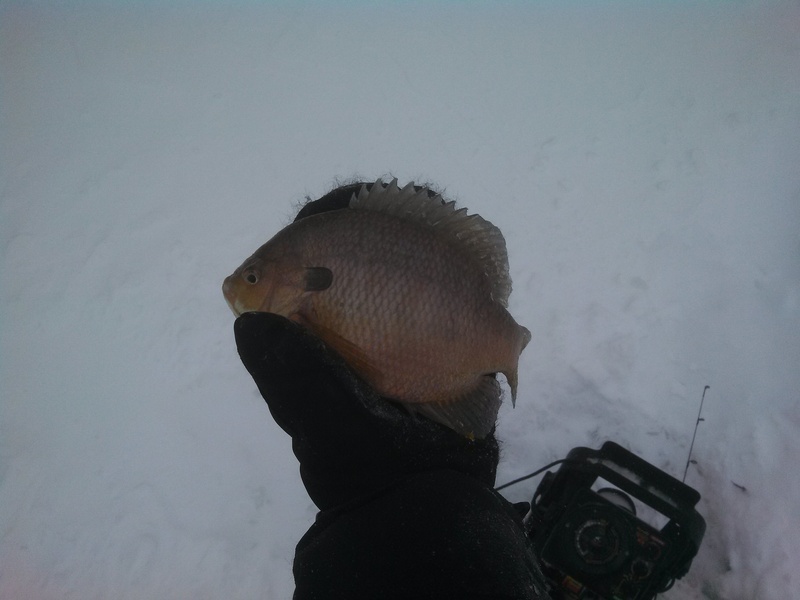 The first hole I fished was the most productive of them all producing many perch and a few seeds. I fished around those holes for and hour or so without a crappie sighting so I decided to make a small move. I had found a nice weed flat adjacent to deep water this summer and thought I would punch a few holes on the inside turn. I cut two holes and dropped the transducer for my Vexilar FL-18 down the hole. I was met with 12 feet of water, this is usually a little shallower than I thought the crappie would be holding in this pond but I have it a shot. I usually don’t fish a hole in deep water for crappie unless I’m marking suspended fish, but thinking to myself that I wasn’t really in deep water I should drop my bait down and see what happens. My bait reached three feet under the ice and I was all of a sudden marking a big red racing up towards it. I was using a Bentley tungsten jig with Maki Plastics. The fish literally pounded the bait and out came crappie number one. The times in the past when I have fished this body of water had been slow but productive. 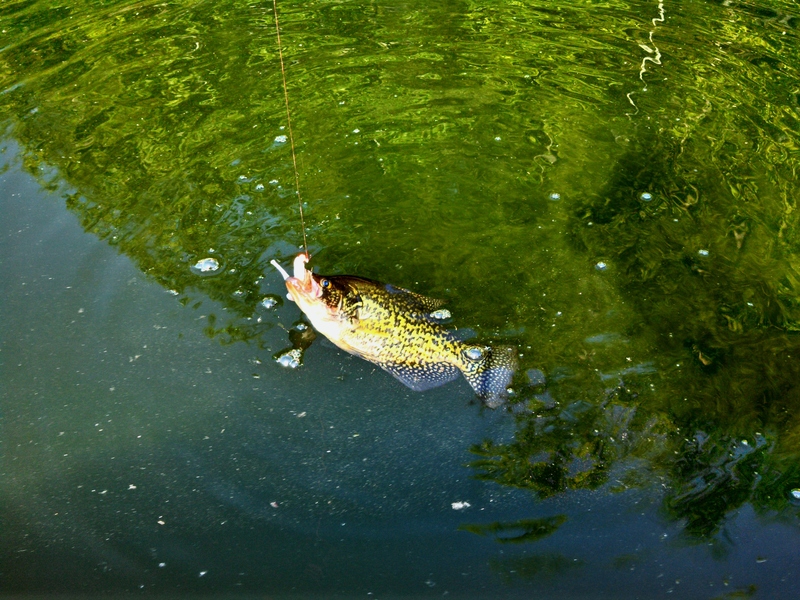 I had never caught more than one crappie out of a hole and I had never caught more than six in an outing. Well to make a long story short the next 45 minutes ended up being the best crappie fishing I have ever had in my life in terms of numbers, aggressiveness of the fish, and overall quality. It was stacked with fish, they were marking from 5 feet all the way down to 12 feet of water, and they were hungry. At one point my plastic ripped off and I was catching 11 inch crappie on nothing other than the glow jig. 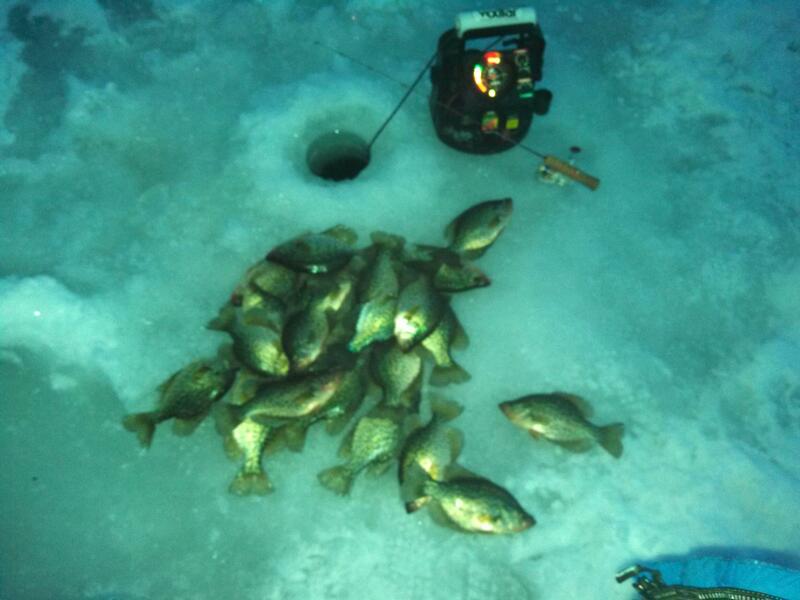 I iced 52 crappie in about 45 minutes of fishing, and that was even with a stop to teach a local about the Vexilar. It was a fantastic outing, one of best I have experienced. I hope to get back there for a morning bite to see if the fish are as aggressive as they were that night. The best part was that I managed a limit for the freezer and still made it home in time to clean fish and await the arrival of my wife.